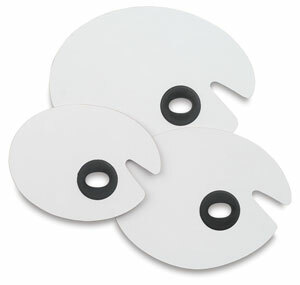 Richeson's melamine-laminated palettes feature a neoprene thumb insert for a more comfortable grip. The melamine surface is easy to clean. A variety of sizes and shapes are available to suit the painting needs of all artists. Each palette is 3/16" (5 mm) thick. Unless otherwise noted, these palettes may be used with either the right or the left hand.